ROME (Crux) – Various news agencies have reported, and Crux has confirmed, that the Vatican will shortly announce a ruling in the case of former Cardinal Theodore McCarrick, accused of sexual abuse of a 16-year-old boy more than 50 years ago as well as various incidents with adult priests and seminarians. By all accounts, McCarrick will lose his clerical status, more commonly known as being “laicized” or “defrocked.” When that decision is involuntary, it’s considered the death penalty for a cleric in Church law, the most severe punishment that can be imposed for especially heinous offenses. 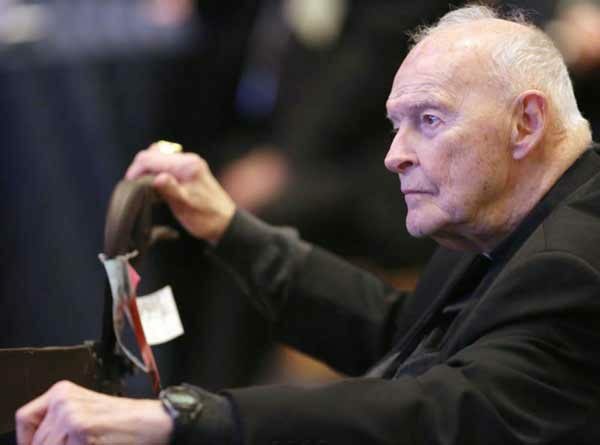 McCarrick already received an unusual sanction in July, when he became the first cardinal in a century to lose his red hat. Assuming the laicization happens, he would also be the highest-ranking Catholic cleric in modern times to suffer that penalty. Much of the reporting has indicated that the timing of the announcement is deliberate, in that Pope Francis and his Vatican team want the McCarrick case to be resolved before a high-profile summit of presidents of bishops’ conferences from around the world on the clerical abuse scandals set for Feb. 21-24. Here’s the thing, however: Even if McCarrick is defrocked, that hardly would mean his case is over. To be sure, the specter of a former cardinal suffering the Church’s ultimate penalty would send an important signal ahead of the pope’s summit, suggesting that Francis is committed to a “zero tolerance” policy no matter who’s involved. We’ve known for a while that at least in most parts of the West, the Catholic Church has adopted stern accountability measures for clergy who commit the crime of abuse of a minor. Faced with such an allegation, a cleric will be immediately suspended from ministry while a Church investigation unfolds and his case is reported to civil authorities. If he’s found guilty, he’ll probably suffer loss of the clerical state, meaning he’ll be defrocked. That’s been true for more than a decade now, and the only thing such a decision in the McCarrick case would add is that cardinals aren’t exempt. Yet that’s only half the battle, because what survivors and reformers really want isn’t just accountability for the crime, but also for the cover-up. What’s angered people from the beginning about the McCarrick scandal isn’t simply the pattern of behavior that’s been exposed, which may be especially galling because it involves an ex-cardinal but which, in itself, is sadly familiar. What’s created the deep sense of frustration one senses at the Catholic grassroots is the perception that senior authority figures in the Church were aware of concerns about McCarrick but continued to move him up the ladder, often for reasons of politics and self-interest. The real demand has been for full disclosure about who knew what, and when – who propelled his rise to power, and what did they know about the rumors and reports concerning McCarrick at the time? At the time, the Vatican also seemed prepared to let the chips fall where they may, signaling that the investigation might place some senior churchmen in a bad light. “From the examination of the facts and of the circumstances, it may emerge that choices were taken that would not be consonant with a contemporary approach to such issues,” that statement said. Finally, the Vatican explained the reasons for such a review of its files in the clearest possible terms: “Both abuse and its cover-up can no longer be tolerated,” it said. Precisely … there’s either accountability for both the crime and the cover-up, or the job’s not done. It’s now been more than four months since the Vatican issued that pledge of a thorough study, and, so far, “due course” would appear not yet to have arrived since no information about the study’s findings has been released. Granted, experts warn that there almost certainly won’t be a “smoking gun” in the archives, meaning indisputable proof that someone had firm knowledge of McCarrick’s sins and still advanced his career. At most, we’ll likely get hints and be left to connect the dots, nothing more – but, of course, even that would be more data than we’ve got right now. If Francis and his advisers want the McCarrick case to be wrapped up before the summit later this month, therefore, just laicizing him won’t do the trick. They’ll also need to explain how we got to a point where such a move is necessary – and, of course, offer some reason to believe we won’t be here again.